Every effort has been made to provide you with a high-quality and usable product. Most products and activities are made using the maximum amount of space on a sheet of paper. To make sure your printer does not cut off any of the edges, please click on the image below to download a document that will show you the necessary steps. Directions included in this guide are provided for both a Mac and a PC running Windows. 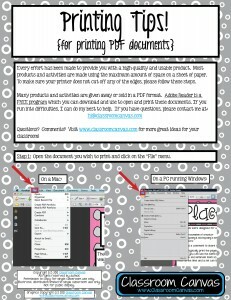 Click on the image to open the document as a PDF! I love the product, but am having trouble getting the document to print through my district’s printing center. It keeps coming back that the pdf HalloweenBingoandCenterActivity.pdf is not valid. I have not tried to print at home, because the quality isn’t there as it is with the doc center in our district. Any ideas would be greatly appreciated! I wold really like to get it printed and laminated before our fall festival. Thanks! Hi! Thank you so much for your kind words! I am sorry you are having trouble using the file the way you wanted! I am not sure of the process you use to send your documents; however, sometimes there are attachment size limits. The Halloween Bingo file is pretty large (5.4 MB). If you can get some information from your center on their file size limits, feel free to email me (hi@classroomcanvas.com) and I will see if I can help you get the file down to what they need (no guarantees, though I can try!). I hope this helps!